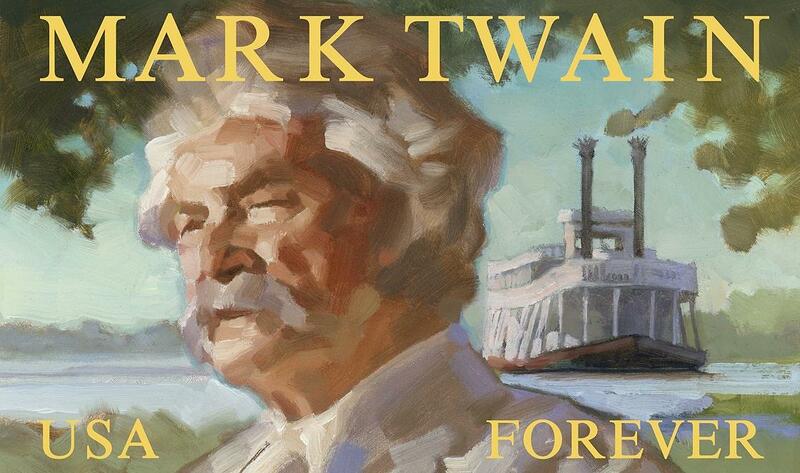 Attached art for the 2011 U.S. postal service FOREVER stamp dedicated to MARK TWAIN. 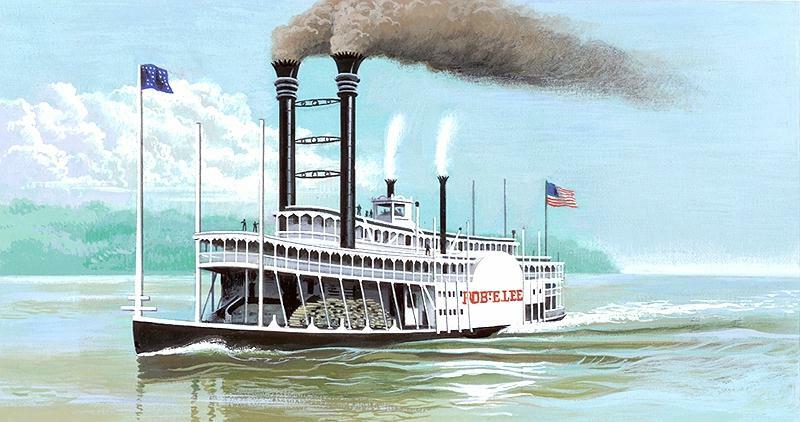 I believe that the artist based the steamboat on the little White River (Arkansas) steamboat MARY WOODS No. 2 that was on display at Jacksonport, Arkansas until she sank and nobody wanted to pay the cost of restoring her so she was scrapped in 2011. The attached photo of the WOODS from the CAPTURE ARKANSAS photo site was taken by Marvin Barrow and copyrighted by him 2014. Jacksonport site feature on the WOODS from back when she was still a tourist attraction. The WOODS had the distinction of playing the "PAUL JONES" in the 1979 T.V movie MARK TWAIN BENEATH THE LAUGHTER in the sequence where Horace Bixby is "learning" the river to young Sam Clemens on the Mississippi. Stw tb sh 1931-1949. b. Nashville, TN (hull) and completed at Memphis, 111x26x4.4. Engines, Gillett & Eaton, 123/8's-6 ft. stroke. Engines new but boilers, doctor and pumps from the FRANK E. WOODS. Capt. Clarence Moxley came out master. Capt. Ed B. Warner, approaching 81, was pilot on her in White River, March, 1940. 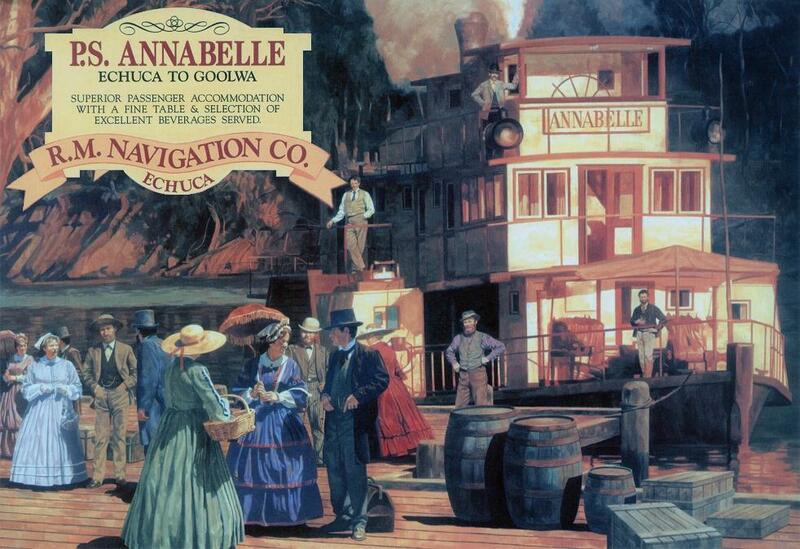 He once piloted the packet CHICKASAW to Memphis with her largest cargo of White River cotton. Capt. Charles Warner also was on the WOODS as pilot. Converted to diesel at Memphis in 1949. Owned by the Woods Lumber Co.. Memphis, until sold in February, 1960 to Potlach Forests, Inc., Clarendon, AR. Decommissioned in 1967. Potlach donated the MARY WOODS NO. 2 to the Arkansas State Publicity and Park Commission in 1967. 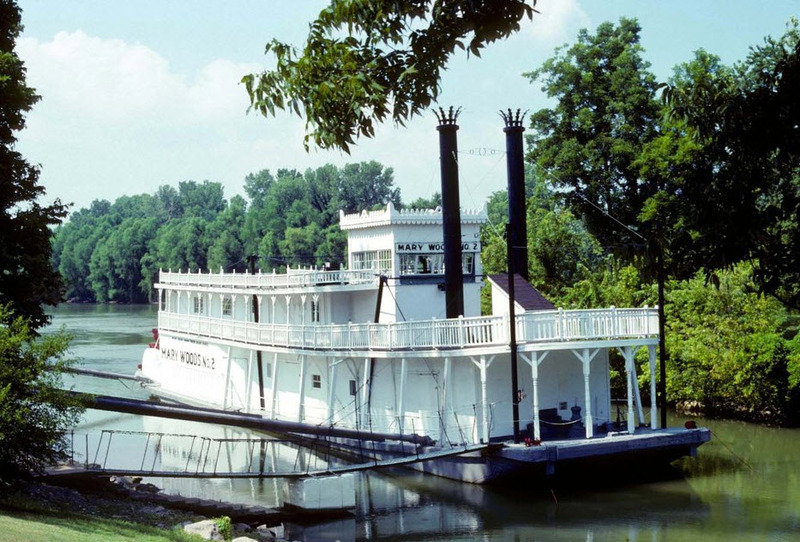 She was restored and exhibited at Jacksonport State Park, a mile west of Newport, AR on Highway 69. From the Australian Heritage Collection commissioned by Connell Lee. Printed on top quality tin plate with safety rolled edges. Australia's most talented artists and illustrators were employed to reflect the best of our landscape, traditions and icons. The highest quality manufacturing processes available were used to ensure the sign range is of global standard. Dean Ellis painted 5 steamboats for a commemorative set of U.S. first class postage stamps in 1996. In the file with the 5 stamps I have simulated a postage cancel with some wave-like lines along the bottom of each. In Dean's painting of the ROB'T E. LEE in the larger file his brush strokes are visible particularly in the sky, water, smoke and steam. Have wondered if there might have been a sixth stamp intended for the commemorative set of the NATCHEZ that wasn't released because there is a print of a painting of the NATCHEZ to which were affixed the 5 commemorative stamps. I sent you a file on that print with the stamps attached that you'll come across when you make your next update. 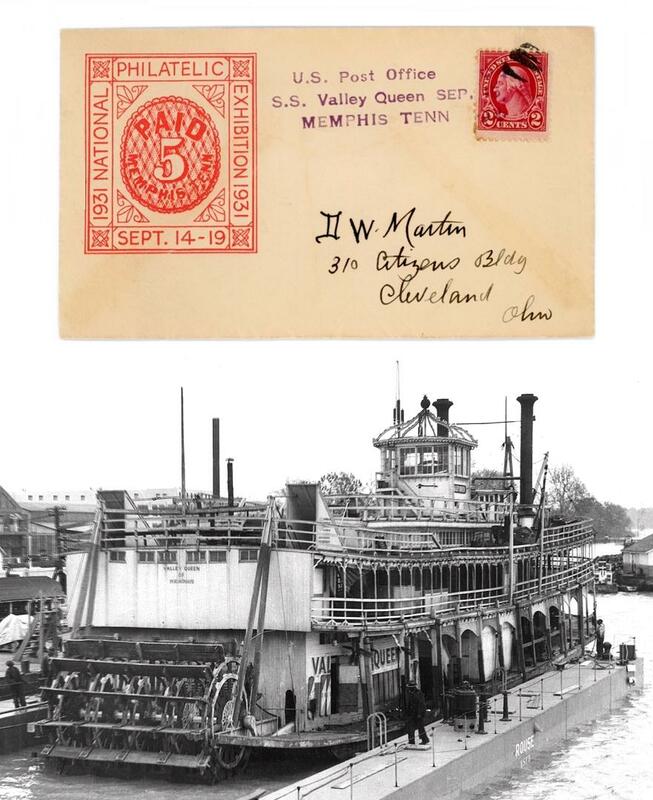 Name was changed from JO HORTON FALL to VALLEY QUEEN when purchased by Captain Peters Lee and others around 1926. 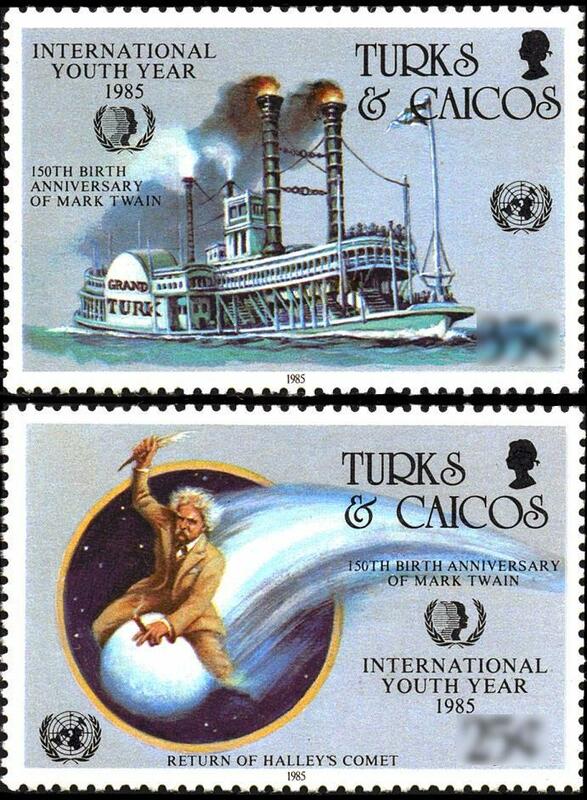 In addition to the Disney - Twain themed stamps in 1985 (which was not only "International Youth Year" but also the 150th anniversary of Mark Twain's birth, November 30, 1835) there were also commemorative stamps issued for the Turks & Caicos Islands. The artist did a nice job depicting the steamboat GRAND TURK (probably based on the lithograph Henry Lewis made in 1848 that we have on one of the illustration pages) and Mark Twain riding Halley's Comet which was in the sky when he was born in 1835 and when he died on April 21st, 1910. Clemens had often predicted that he would pass on when Halley's comet returned 74 years, 4 months, 23 days after he was born. The Turks and Caicos Islands , or TCI for short, are a British Overseas Territory consisting of the larger Caicos Islands and smaller Turks Islands, two groups of tropical islands in the Lucayan Archipelago, north of the larger Antilles island grouping. There is also a strong influence from Cornwell's ROB'T E. LEE painting in the depiction of the GRAND TURK which was different primarily in the design of the upper deck and pilot house etc. which is apparent in Henry Lewis' lithograph. 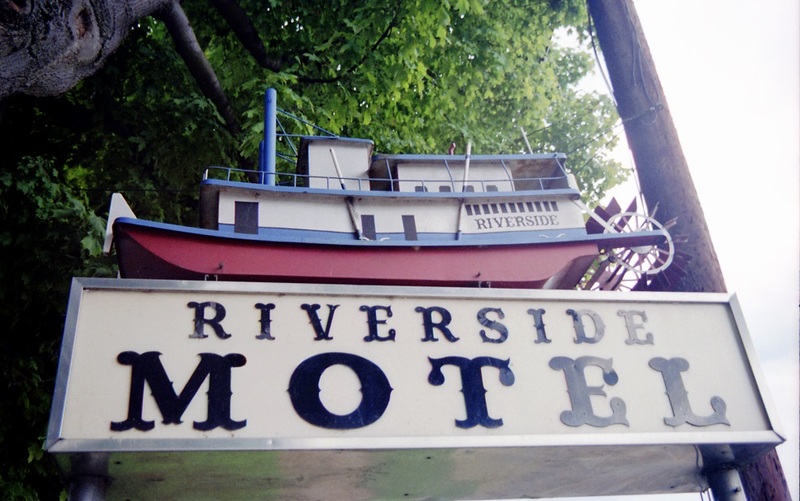 "Folk art" style generic towboat model of "RIVERSIDE" above sign for the Riverside Motel along the Ohio River at "Gallup-Police" (as it's pronounced locally) during my drive down river from Marietta on the way back to Cincinnati in Sept. 1990. Current Google maps photo shows the sign is still there in 2017. 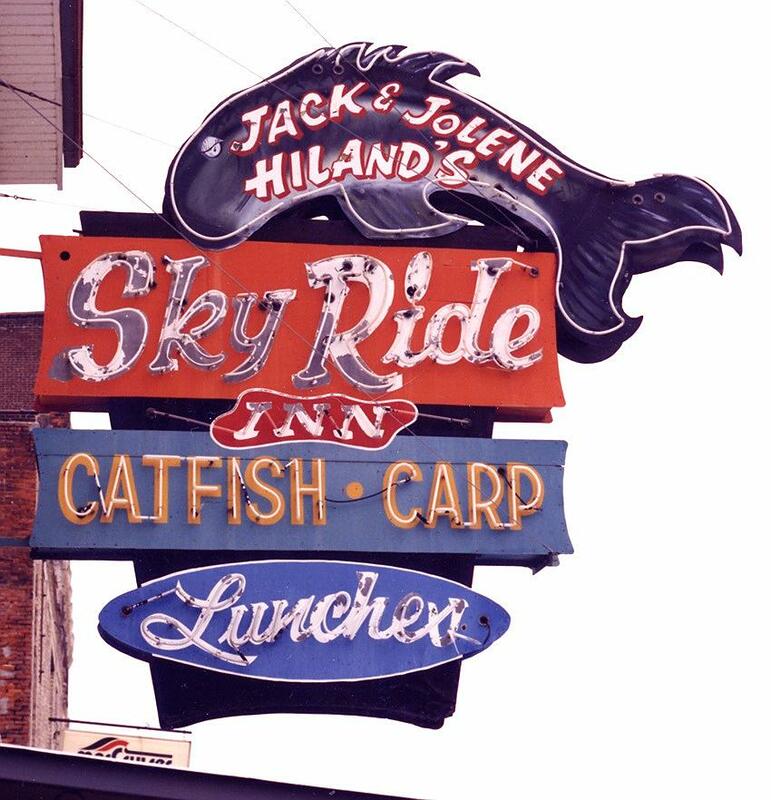 Neon sign with patina that I photographed in the 1990's: "Jack & Jolene Hiland's Sky Ride INN - CATFISH CARP Lunches" used to be located on 236 North Front Street at the corner of Vermont facing the Mississippi River in Quincy, Illinois which is about 15 miles as the crow flies north of Sam Clemens' hometown, Hannibal, Missori. I never dined at Jack & Jolene's but it sure had genuine rivertown amibance from the outside. The restaurant "Chick's on the River" is now at this location. This could go with the photo of signage at Canton, Missouri. Maybe a "roadside (or 'riverside') attractions" page would be a good fit for signage and other quaint vintage "stuff." 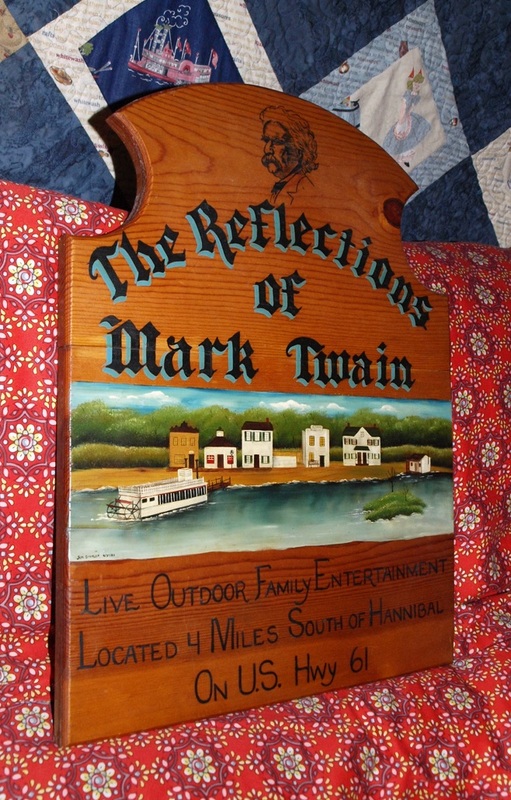 The outdoor set for "Reflections of Mark Twain" off of Highway 61 south of Hannibal was where the local "pageant" revisiting Mark Twain, Tom Sawyer and Huck Finn was performed for tourists. 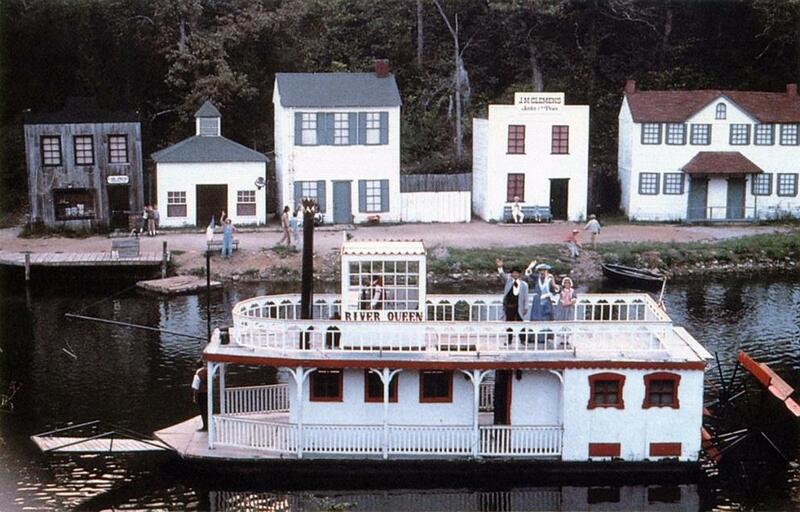 I never attended a performance but visited the sets which included mock ups of the home of Becky Thatcher (visible to the left of the riverboat across the man-made lake that I photographed in the early 1980's). The boyhood home of Sam Clemens a.k.a. 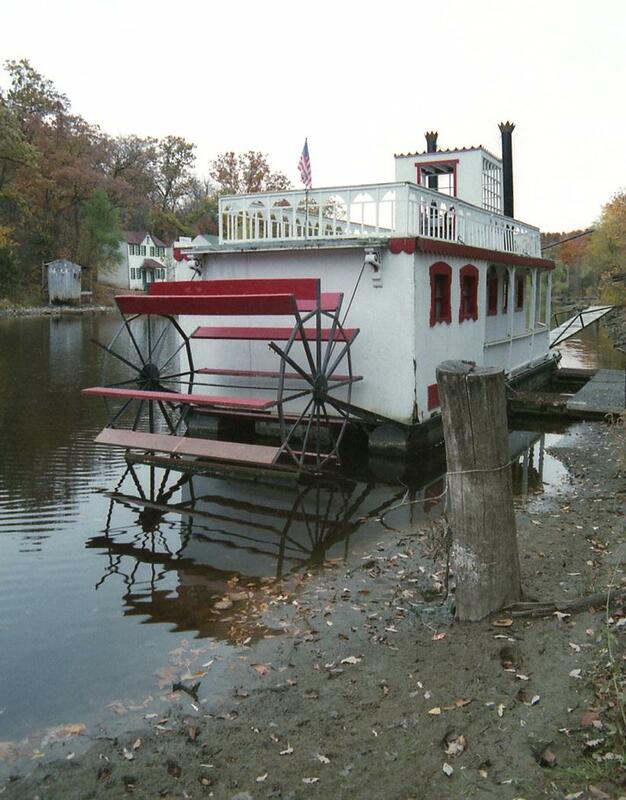 Tom Sawyer home and the Justice of the Peace of office of Sam's father were also replicated next to Becky's and there was this modest little sternwheeler on the lake in the foreground that Jim Waddell describes below. On the website for nearby Injun Joe Campground site there's a photo showing that the replica structures have all vanished and the bleachers where the audience sat haven't been painted in a long time. "You included a photo of the only steamboat I ever piloted. Actually, it was a 50-foot pontoon boat with a 35 horse power outboard motor that occasionally performed its duty. I managed that facility and it is indeed nothing more than a memory now. The cast list called for 22 actors and, since payment was a pittance and we relied heavily on youngsters, there were times when I had to go into the audience and draft warm bodies from the ranks of the paying clientele. It was not really a problem since the whole production was sound-synced and it created a memory for the volunteers that I'm sure they still cherish." In addition here is a photo I just took of an original 16 x 21 inch sign painted on pine by Jeri Stotler dated April 27, 1983 promoting Reflections of Mark Twain in an American primitive/Grandma Moses sort of style. Forgot I had it until I spotted it on the wall behind an old photo of the late Jim White taken at a Hannibal eatery that looks like it was named "Laickrs" and whose motto was "Bester Bestest." According to the internet Jeri is 56 now and has lived in the Missouri cities of Columbia and Vandalia. Scan of the pictorial portion of "sign on pine" in an American primitive/Grandma Moses sort of style hand painted by Jeri Stotler, dated April 27, 1983 promoting the local Hannibal, Missouri "pageant" - Reflections of Mark Twain . Forgot I had it until I spotted it on the wall behind an old photo in a tribute to the late Jim White at a Hannibal eatery that appeared to have been named "Laickrs" and whose motto was "Bester Bestest."